As you know if you read my last two posts, last weekend I played in the Western States Open in Reno, Nevada, always one of the best-run and most popular tournaments of the year in this part of the country. About 340 players were on hand to celebrate the tournament’s silver anniversary. The turnout could have been larger, but the San Francisco weather forecasters scared some people off by predicting nasty weather in the Sierra mountains over the weekend. The hardy souls who did show up were treated to highly competitive chess, a prize drawing in honor of the tournament’s 25 years, and (need I say it?) perfect weather. In the open section,Â 17 titled playersÂ showed up, including America’s newest grandmaster, Jesse Kraai. Seven of those 17 ended up sharing first place with 4.5-1.5 scores: Ildar Ibragimov, Sergei Kudrin, Alexander Ivanov, Enrico Sevillano, Alex Yermolinsky, Melikset Khachiyan, and Gregory Serper. As usual there was a playoff to decide the official bragging rights. Unless I miss my guess, none of the players take these speed playoffs too seriously. Khachiyan said, “In Russia we have saying: as well you drink, as better you play,” as he “prepared” for the playoff with a beer bottle in his hand. Unfortunately, the playoff always begins around midnight, and by then I had already gone to bed. So I don’t know if Khachiyan’s preparation was successful. I wanted to do a few interviews to see if I could actually play in a tournament and be a reporter at the same time. It didn’t work out too well, but I did get to meet a couple of interesting people. Robby Adamson, who beat me in 14 moves in round one, is the coach of one of the country’s top high-school chess teams, Catalina Foothills High School in Tucson. He is proud of their accomplishments, pointing out that their leading competitor (Edward R. Murrow High School in Brooklyn) has strong Russian players practically dropping from the trees. On the other hand, all ofÂ Adamson’s talent is home-grown from the ground up. If you’re interested in reading more about this unique rivalryÂ (from the Brooklyn point of view!) check out Michael Weinreb’s wonderful book, The Kings of New York. It was inspiring to talk with Adamson, because he is the answer to the question of whether it’s possible toÂ combine a successful chess career and a demanding “real career.”Â Along withÂ his night and weekend job coaching and playing chess, Adamson is a lawyer by day.Â Even though he is onlyÂ a part-time chess player, he can compete at the top levels of American chess.Â He followed his blowout win over me with an impressive upset win over AlexanderÂ Ivanov, who eventually tied for first in the tournament. Robby is easy-going and fun to talk to; with his short-cropped hair and ingenuous personality, he could easily win a “most likely to be confused with Matt LeBlanc” contest. My other “interview,” if you want to call it that, came about by pure serendipity. 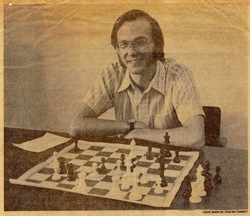 I was eating breakfast the morning after the tournament, when a slightly disheveled teenager with a backpack came up to me and said, “You’re a chess player, aren’t you?” I recognized him because we had played on adjacent boards, and he introduced himself as Erik Kislik, a 19-year-old from San Mateo. He was looking for a ride home, so he wouldn’t have toÂ take the Greyhound bus. As I learned later, this was pretty normal for him; he hadÂ arrived in Reno with noÂ hotel reservations and no plan for getting back home. The five-hour car ride was long enough for Erik to tell me most of his life story. At this point in his life, all he wants to do is learn and play chess. At school, he spends 9 or 10 hours a day reading chess books and playing online. His courses, apparently, are just a nuisance; he squeaks by with studying the day before a test. As a former college teacher, I couldn’t help but be dismayed by his cavalier attitude towards classes.Â I told him that he was missing an opportunity that will probably never come again in his lifetime, a chance to find something he’s really passionate about and learn all about it. But he answered that he’s already found his passion: chess! I couldn’t really argue with that. Kislik has an intriguing approach to chess mastery: His goal is to read every book written by a living master rated over 2600. (He doesn’t think that lower-rated authors are worth bothering with. Also, older players like Alekhine and Capablanca are not relevant to modern chess, because their opponents did not play the kind of dynamic, fighting chess you see today.) There are fewer qualifying books than you would think, because theÂ very top players are not the most prolific writers. He estimates that there are about sixty books that fit his criteria, and he has read about half of them. So far, Kislik’s rating is only 2115 or so. But if he can keep up this unique training regimen, I would look for him to break into the master category very soon. Update, for anyone interested: Kislik soon became an IM and recently published a book, Applying Logic in Chess, which details his methods.